In a few short but very windy hours last week most of the autumn leaves were blown away and winter breezed in. I had hoped to get out for a few more autumn walks but I've missed the boat for this year. Though I did manage to take some pictures around the garden before most of the leaves blew away and gather up some wonderful leaves from our neighbours cotinus smoke bush to dry. Still, the arrival of winter and the few early morning frosts over recent days have given me the perfect excuse to cast on a new pair of mittens and knitting by the fire is a happy trade off. The pattern above is Pinwheel Mitts by BomBella designs (Ella Austin) in collaboration with Loop. I'm using yarn from my stash; Madeline Tosh sock in Robin Red Breast and The Uncommon Thread tough sock in Manuscript and the pattern is working nicely with the contrast. They'll be a perfect pair of christmassy mittens to go delivering presents in. Project notes are here. Temperatures are set to dip into negatives tonight so I'm changing duvet covers on everyone's beds here this afternoon and getting blankets ready. There are still a few bunny tails to sew on but that's my job for this afternoon, so I thought that as time is marching on I'd stop procrastinating and just get on with listing this little batch of mostly finished animals. The first 10 of them are listed now over on my shop blog where I am selling them via a kind of lottery system. I do this because when I sell the animals on Etsy in timed batches I always get emails from disappointed people who have slow internet connections or who are in time zones that make it difficult for them to be on their computer at the allotted time. Selling 10 of them via random number generator to select a recipient gives everyone a fair and equal chance of buying. The details of how to register your interest in any of the animals are over on the shop blog. Please read the post at the top of the page there as it explains what to do. I'm also going to be listing 6 over on Etsy. Details will be sent just to those who have signed up to my mailing list. If you do miss out this time round please know that it's not my intention to frustrate or upset. If you feel compelled to write and tell me about your frustrations or disapointment then I will do my best to reply with good grace but I cannot take on special orders because it simply wouldn't be fair to everyone else. Thanks so much as always for your kindness and for supporting my little business. Sorry, it's going to be a short one today. A big chunk of the paperwork for Toby's transition into adulthood support and services arrived on the door mat last week so I've been immersed in that, which if you've ever had to fill out these kind of forms you'll know is a deeply stressful and depressing experience that shows up all of the inadequacies of language in conveying meaning. Seriously, it feels like walking a tightrope over a crocodile pit, one wrong inflection to a sentence and all is lost and all I want to do is ensure he is provided for at the level that he needs. Anyway. I'm ploughing through it, so on to happier things. 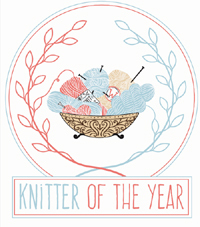 Happily knitting really does help so I've been furiously click-clacking away in every spare minute. I really hope to have a batch of animals finished in the next 10 days or so (barring the arrival of any more paperwork). Some of these bunnies have been waiting a year for their clothes but I don't have too much more to do now, a few arms and tails, lots of french knots and buttons to finish off and then just pondering names, making labels and hopefully remembering what yarns I used for each so I can write descriptions. 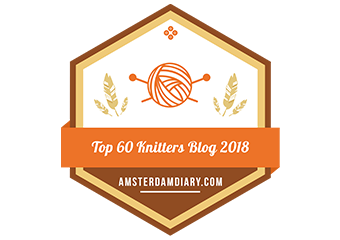 I will keep you posted when they are ready and send out an email to my mailing list with full details - the sign up form is over there on the right of the screen if you wanted to join. 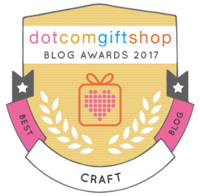 Other happy news has come my way in the form of a blog award and I'm very proud to have been awarded Craft blogger of 2017 from dotcomgiftshop thanks so very much to everyone who voted for me. Lastly, before I go and start form filling again, I will be helping my friend Hazel on the cake stand at a new event called The Creative Social taking place in Hertford town this Saturday. 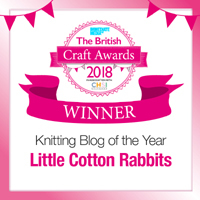 I'm also going to bring my knitting and some of the little cotton rabbits (just for showing, not for selling) so if you're passing pop in for some homemade cake and say hello. I'm happy to answer any questions about the patterns or to demo any techniques if you wanted to ask anything in person. It would be lovely to meet you if you're able to make it. Edited to add: I'll be a little bit late as I have to drop Toby off for respite on the way so will be there around 10.30am. Will be back here again soon once all the paperwork is slain!